To understand the geographic evolution of beer syles in late medieval and modern Europe we have to go back to the basics. Beer was a local good except for the Hanse trade over Rivers and the North- and Baltic Sea. Beer was brewed in the medieval with different cereals and herbs. Barley became dominant as a superior brewing grain. But because Barley was also used for Bread in case of shortage it was Oats which was well suited for brewing and improper for baking bread. Wheat was a newcomer and in case of availability it made its way into beer more and more ruling out Oats. Rye was the great bread-grain and could never really establish for brewing. Millet was also traditionally used as cereal but i never saw it in the context of brewing. Maize was new since its introduction but it was also never used for brewig. Spelt was sometimes used in place of Wheat. The replacement of gruit with hops. The spread of the new styles of Wheat beers. The spread of pale Malt based pale Beers. The last two are closely interwoven as the two new techniques spread as a combination in the first place. All of them are connected with Hamburg and the Hanse! The first evidence of larger amounts of Wheat in beer documented is for Hamburg 1374 where hopped beer was traded over the sea to cities like Amsterdam. 1. Hops were costly traded in so they wanted to spare them for export beers. They needed a style for local consumption that was lower in hops, paler wheat beer tasted better with less hops. 2. They had already made the connection between dark malts and poor efficiency - they knew how to make paler malts and to brew them with infusion mashing. (Gruit beer mashes had to be cooked because the gruit was mixed with the malt - hopped beer allowed them to not boil the mash so they needed better enzyme activity. Also their brown beer was only red!) 3. they had enough Wheat on hand as a trading center - there was no risk for shortage of bread-cereals. Maybe they knew about wheat beer from trading with the nearby Hanse towns like Einbeck (we know there was an Einbecker house in Hamburg where they had Einbecker beer on draft). Einbecker beer was also made for Export and had wheat in it at least this is documented for later times. 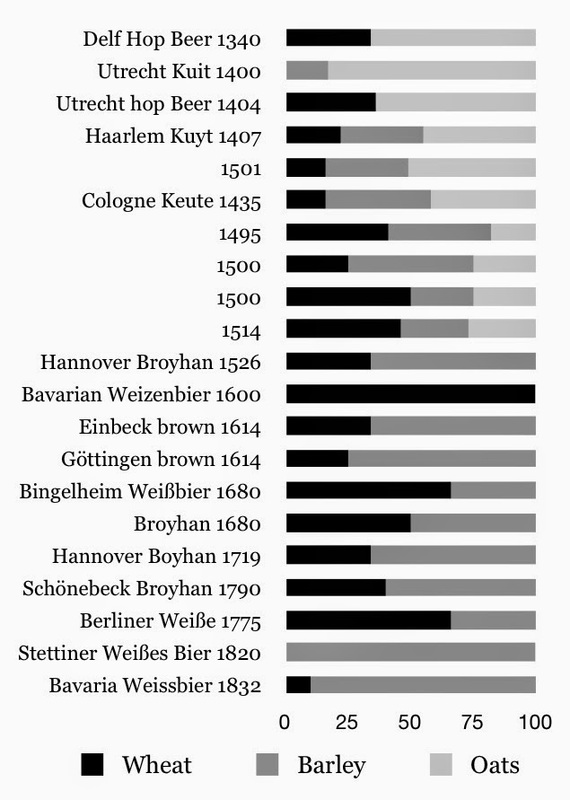 Wheat beers might have also been made first in the other Hanse towns Bremen and Lübeck, as well as in Goslar, Königslutter and possibly Braunschweig. There is no evidence for the hamburg wheat beer to be very pale at this early times. At the other hand there is good reason to believe the popularization of air dried or lightly kilned malts to origin in the lower countries as thy were very short in firewood (they used (unmalted) oats in large proportions, so they also needed enzyme rich malt). In the netherlands they loved the hamburg beer, probably because they didn't use oats in hamburg and hops instead of gruit. But they didn't have enough wheat or barley neither hops to make it themselves. So they bought Hamburg beer and tried to copy it as well as possible. They managed to increase production dramatically and unshiped Hamburg as a dominating brewing center for the western North Sea region. Their oat-based and hopped beer was the fist documented pale or yellow beer. Keutebier as it is known till today in Hamm (also Münster Alt is not far away) is an offspring of the lower countries Koyte, Koit or how ever it may be spelled. in Cologne in the early 15th century Keute was the third style after gruitbeer and "Hoppenbier" coming in from the beer-region (Cologne was more a wine region) since late 14th century. Another path of pale wheat beer was the Broyhan which was the clone of Hamburg beer in Hannover spreading over the lower saxony region beginning with the 16th century. Hamburg was trading hops with Bohemia (an early hop producing region) over the Elbe.Tthat way they brought their wheat-beer style to Bohemia.There they adapted the style. This is reasonable: Bohemia sold pale wheat beer to Bavaria were it was accepted and could establish as bavarian style wheat beer. 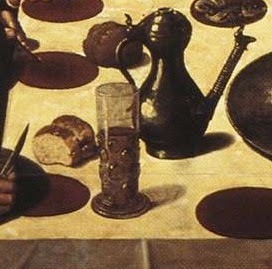 Todays Belgian Whit and Lambic are probably connected to the Keute-style. The rest was all more or less the old kind of brown beer. Everywhere but in Bavaria (even in Bohemia) this stuff was top-fermenting. 1. In bavaria, because wheat was more expensive or forbidden. 2. a later Broyhan with all pale barley malt, probably also because Wheat was rare. while a wheat beer can be brown like the nurnberg whet beer (1775), a brown-beer can contain wheat but it will never never be called a wheatbeer ("Braunbier" equals barley). As there is no term for ale in german I translate all ale or beer as "beer" like the german "Bier". If you follow the old school you would have to read "Braunbier" as beer (as it is hoppy) and the old gruitbeer as well as the new wheatbeers as "ale" because it is low in hops.